A hilarious take on the popular shooter franchise points out the obvious: a cod is a type of fish. CODBLOPSII(Call of Duty: Black Ops II) is one of the stupidest acronyms of all time. A cod is, of course, a kind of fish, and one enterprising fan has built an entire game based around this fact. Introducing CoD of Duty, the premier shooting fish in a barrel simulator. The CoD of Duty "campaign" should take you about ten to fifteen minutes to complete. This is a deliberate move on the part of the game's creator, Ryan Evans, who likens the short and ultimately unfulfilling game to a standard FPS' single player campaign. "A lot of the 'joke' is how I feel about the standard FPS single player campaigns. Short, not terribly interesting, and completely over the top with their story elements." 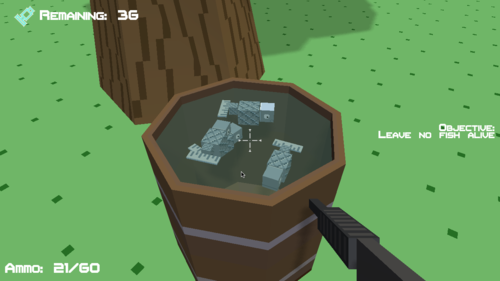 You'll start off shooting fish in a barrel with a pistol, but as the game progresses, gun-toting fish will enter the fray, and your arsenal will expand to include an assault rifle and a rocket launcher. It's not a particularly challenging game, but it's somewhat satisfying to see the fish explode in an exaggerated torrent of gore after you so much as graze them with a bullet. Evans indicated that he wished to include an underwater level and a co-op mode, but felt that the joke might have gotten too old if the game dragged on too long. The game was made as part of the one game a month game jam for indie developers. You can play the game for free, either in-browser using the unity engine plugin, or via a free download for Windows, Mac or Linux. You can even download the game's full source code, if you wish.